← Opening a Charm Pack is the Hardest Part…. I slept most of the day away yesterday, but it seems to have helped and I am headed back to work today. I do have a few things to show from earlier in the week. While quilting on Monday, I set the embroidery machine to stitch out a few things. I really like this basket of flowers design. I need to some up with an idea to use this now. I’ve always liked this red work eagle and I think it would look great alternating with a simple 9 patch for a QOV. 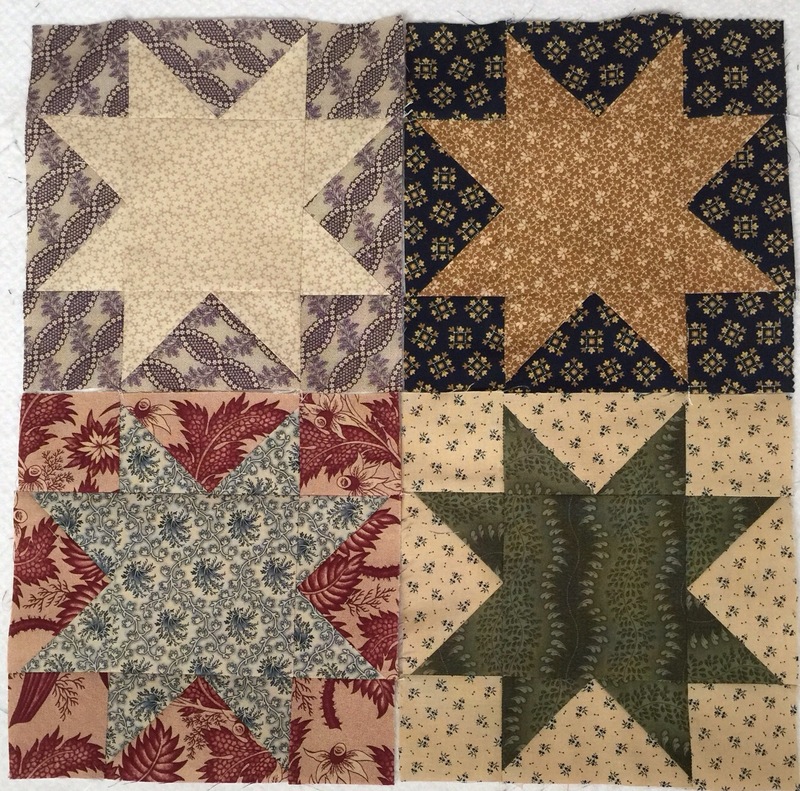 And I finally stitched up a few more sawtooth stars. I carried these bits to Wisconsin and back without working on a single one. I got quite a few made in Arizona last February so they are well traveled. In my day job, I work as a librarian. It is an interesting job and I get to meet such a wide cross section of people. One patron has gotten to be an e-mail pen pal of sorts. She has even loaned books to me! She is sadly losing her sight and I am always on the look out for large print books that she will enjoy. Her husband comes in to pick up books for her so I don’t actually see her often. Tuesday Susanne came in with her husband to see me. 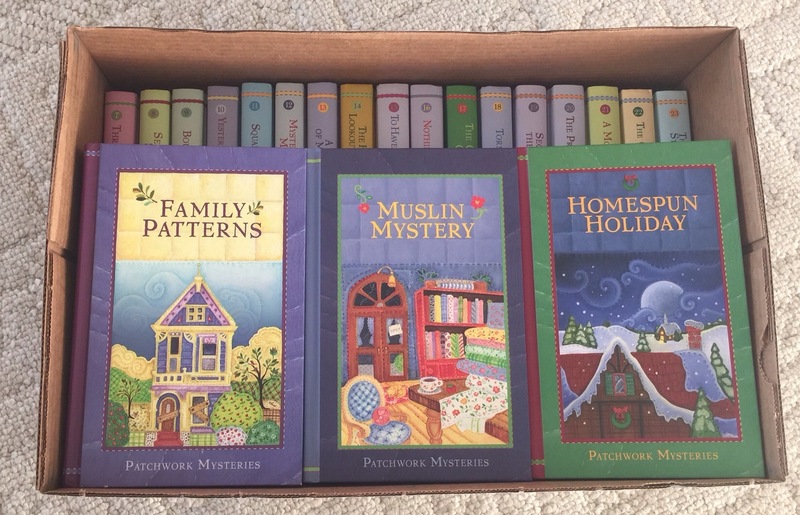 She gifted this set of books to me because she can no longer read them. I feel so honored to have these! But most of all, I am so thankful for her friendship. I was so glad she came in so I could give her a hug in person. Time to get ready for work. I hope you have a great day. So sweet of the lady to gift those books to you! I used to be a senior page in my local library and you do get to know so many people and develop a bond, just by checking books in and out. I remember one older man would come in all the time and sign out paperbacks. He wore a red baseball cap and a black leather jacket. Very nice man. Then all of a sudden I realized he hadn’t been in for a while and a co-worker told me he had passed away. I had to excuse myself and go in the break room because I began to cry. ok, i went to amazon and purchased the first book. while i hope this will be a great series, there are over 20 books!!!! my pocketbook may not thank you in the end! Your books—oh, my! As a retired elementary teacher with an interest in children’s literature, I’m so interested in the content of these books.They are probably not “kiddy lit” . I have 2/3 of a library science degree, most of which is children’s literature. My collection of autographed books competes with my fabric stash for attention. Thanks for sharing this story. Thank you for telling us about Susanne. I hope she is using audio books. With tablets and ipods, listening to books is easy….however not all titles are available. It’s nice to have a friend like Susanne. I love everything about this post, Katy! 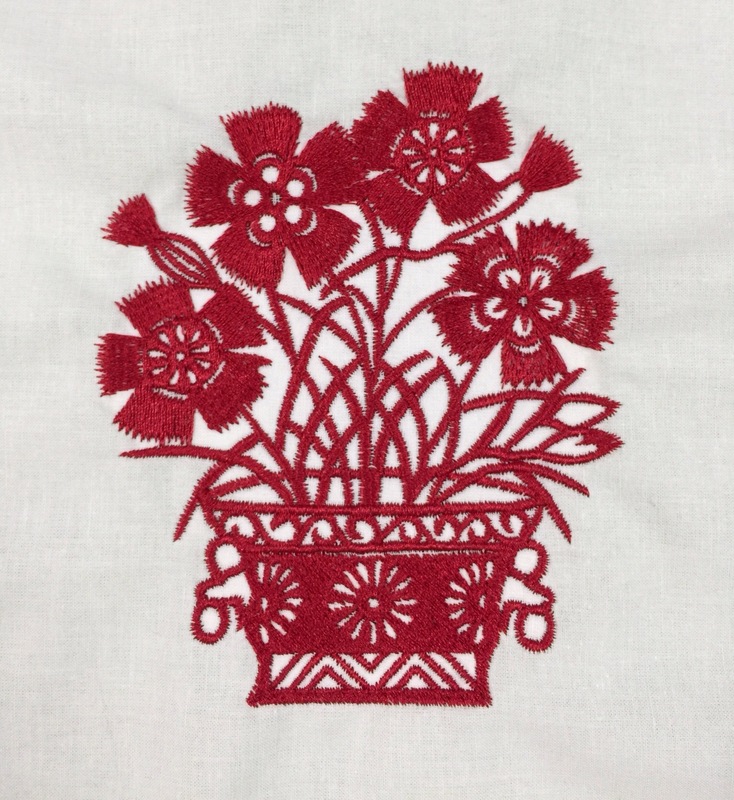 The basket of flowers embroidery is gorgeous as is the eagle design. I’m still a huge fan of your sawtooth stars and have no doubt you’ll get the rest of them in the coming weeks. I didn’t realize you’re a librarian. That was my dream job when I was a child. I was a library aid in grade school. That was back in the day when we used a tool that resembled a wood burning iron to write the dewey decimal numbers on the spine of the book by first placing a small strip of white transferable tape on the spine of the book. We also typed the pockets that were glued into the front inside. They held the cards that showed when the book was checked out and when it was due back. To this day, I would love to volunteer at the library but I have too many physical limitations. I love that you finally got to meet Susanne face to face. Those books were a lovely gift of appreciation. This is very kind from this lady! Please could you tell who is the author of these books?? What a great gift. It’s so good to have wonderful friends. 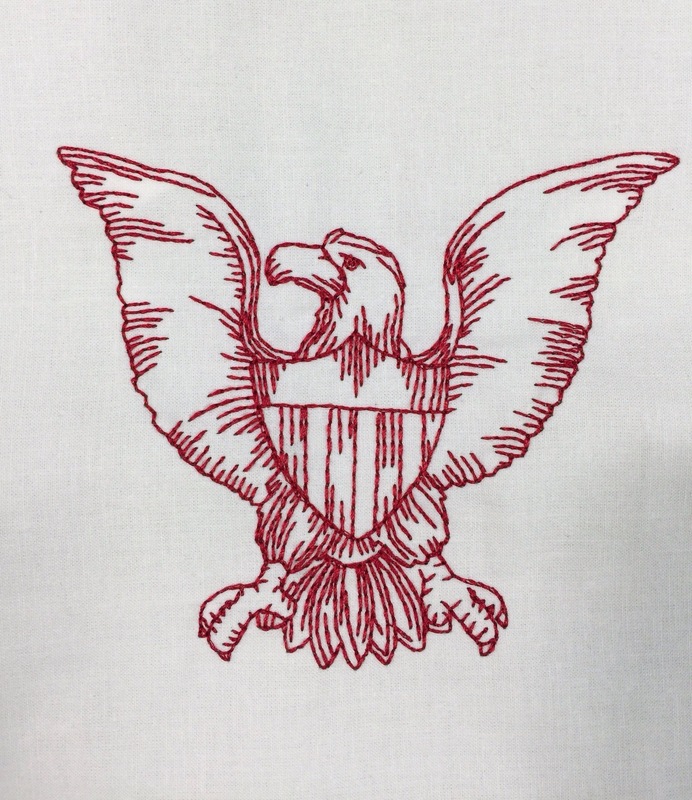 KatyQuilts: would please share the red work design of eagle? Some day I hope to get back into QOV and I like your eagle. Very nice idea…. the lace embroidery is aloe nice pretty. That redwork eagle alternated with nine patches would make a fabulous QOV. How sweet that that your friend gifted you those books … and came in with her husband to give you a hug. I’m glad you’re feeling better. What a sweet story about the books. And – the redwork eagle would make a great QOV block. Alternating it with a nine patch would be just right! How sweet of her to gift the books to you. She knew you would appreciate them!